Join the discussion on our forums! Come discuss Splintergraft over in our dedicated Splintergraft discussion topic. A much worse Zola the Gorgon. The best use for this card is with minions that decrease their cost when a certain condition is met (Happy Ghoul, Arcane Tyrant, Corridor Creeper). So far, one of the more interesting things you can do with this is to play it on a treant deck with Mulchmuncher. When the muncher is discounted enough to cost 0 mana, you can play the muncher, play Splintergraft to get a 10/10 copy and you will be able to play the 10/10 copy immediately or later as the cost decrease is based on the number of treants that died this game. Then you can create further copies of the 10/10 muncher with Ixlid, Fungal Lord or Gloop Sprayer. Maybe after the rotation we will see more of this card or this particular combination. So this guy seems insane in Quest Druid if that ever gets to a point where it works. This and Ixlid make it so you don't need to include a ton of big minions to get value out of the quest. Completing it in a reasonable time is generally been the problem. Haven't tested it, but here. I tried to address the completing the quest problem too. I could also see using oaken summons and stuff to complete the quest maybe? There's just one problem: Barnabus only removes the costs of minions in your deck. Which does not include the copy made by this card's battlecry, so if you're using it to get value out of the quest, tough luck. Tested it, it works. You get 10\10 Ixlid for 10. And you can play a bunch of 0 cost minions with him. It`s actually pretty good. Should I disenchant him? I got a golden one in a pack and he's the only legendary I've gotten so far that I haven't used. I would use him but there's two problems. One, I don't really have enough good druid cards to make a deck for him. Two I have no idea how I would even play him. What is good combo with him, what are good targets for his ability? I don't feel cheated or anything but I have the potential to get a free Legendary of my choice and I kinda wanna take it. I play him in a deck alongside Hadronox and I think it works well. I think it’ll be good in standard after a few weeks when things settle. I got this trash as my free legendary. Meme card at best. Seems way too slow. That is not the voice I expected out of that tree. I don't see this as a good addition to a quest Druid deck. Even if you get to play this for free after completing the quest, you want to be spending 10 mana on Ultimate Infestation, not a single 10 mana minion. On the one hand, you could get the same result by just copying Ancient of War. On the other hand, a 10/10 Angry Chicken... you may be onto something there. 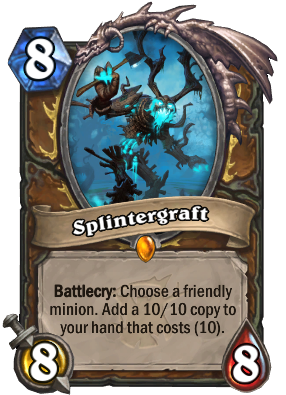 Splintergraft makes whatever you make a 10/10 cot 10 regardless of original cost right?